This House with a floor area of 440m2 also features 9 Bedrooms and 6 Bathrooms. This property was on sale for 2 months. 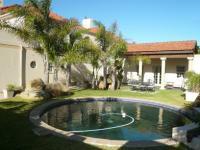 also features 0 Bedrooms, 0 En Suite, 0 Bathrooms, 0 Living Rooms, Staff Room and Flatlet. This property was on sale for 8 months. First offer was received 6 months after listing and at 40% of valuation. Highest offer received was on 24 Jan 2017 for 250,000.